Next Question: How Much More Canadian Can It Get? Even though I live in the Northeast, I don't get hockey. But I guess when it's played out on a frozen lake, there's something really majestic about it. 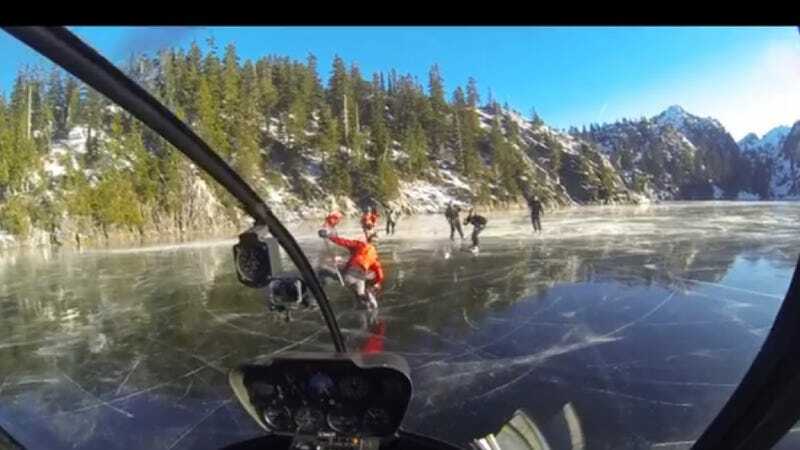 Add in a helicopter playing hockey and it just got way more interesting. The pilot doing the stunt was crazy talented, too, making it even more amazing to watch. Helicopters. Ice. Hockey. Beautiful scenery.Followed by a polite apology and reasonable explanation. Helicopters. Ice. Hockey. Beautiful scenery. Followed by a polite apology and reasonable explanation. This is the most Canadian story that has ever existed. Oh, it could be more Canadian. I didn't see a Tim Hortons anywhere.